This page serves as a basic introduction to the flags or Fahnlein which the Landsknecht units carried into battle. I will touch upon the more well known flags as well as a few basic pieces of advice to give you the potential for literally hundreds of historically and geographically accurate flags. Clockwise from the upper left; Rennfahne, Reichssturmfahne, Cross of St Andrew simple and ragged. 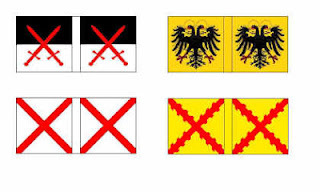 The Rennfahne was the flag of the Arch Marshall of the Holy Roman Empire who held the responsibility of the protection of the Emperor and the representation of his interests on the field. It is occasionally referred as being the flag of Georg von Frundsberg; which it was in the respect that he was the supreme commander of the imperial forces under Charles V but this is not to be confused with his personal standard. 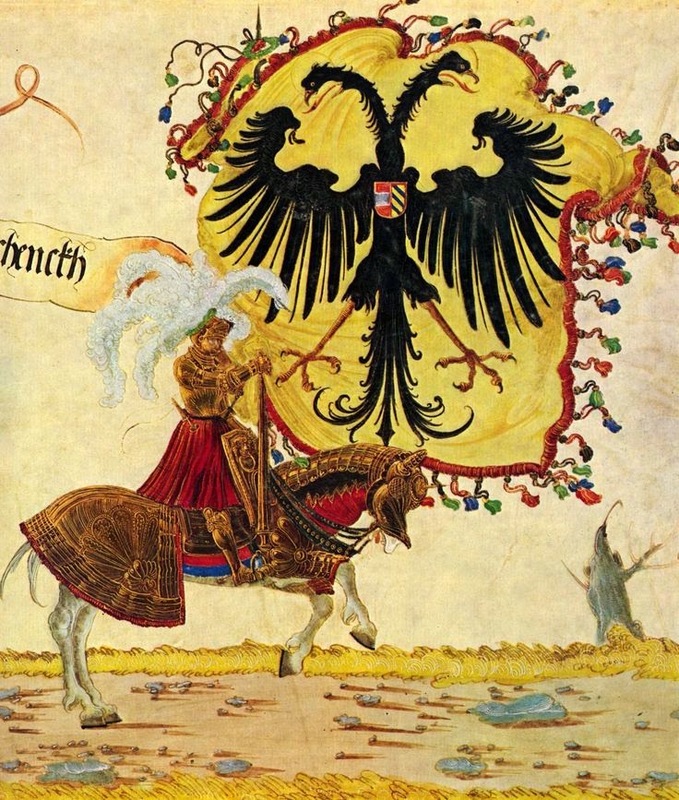 The Reichssturmfahne was the imperial battle flag and bears the double headed eagle, sometimes with the arms of the emperor in a shield on its chest as in the image below. When the emperor was not present the standard of the commanding officer became the battle flag. The Cross of St. Andrew was a Burgundian motif adopted during the reign of Maximilian. It is shown appeared in either simple or ragged forms upon both plain and striped backgrounds (more on this later). Contemporary paintings (particularly that of the battle of Pavia) show variants of this with the heraldry and cross being gold and red upon a blue or yellow background. Further to the flags above other Fahnlein bore the colours and / or the heraldic devices of the captain or city. The example below shows the variants one can achieve with this. 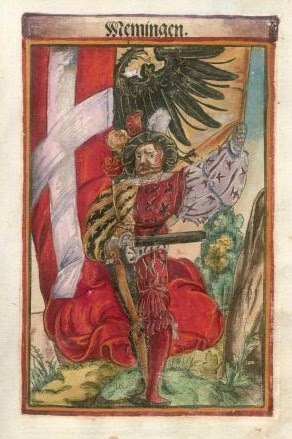 The banner on the top left row is the coat of arms of the Fugger family (a wealthy and influential family from Augsburg). The remaining banners are variants using the colours from their crest and in the example below right also indicating their imperial allegiance. 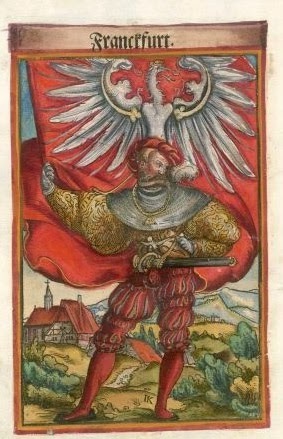 Many contemporary paintings and woodcuts show simplified banners such as these. Whether this is artistic license or accurate representation one cannot be sure but from a wargamer's perspective they are a neat way to represent a number of units being under one commander. 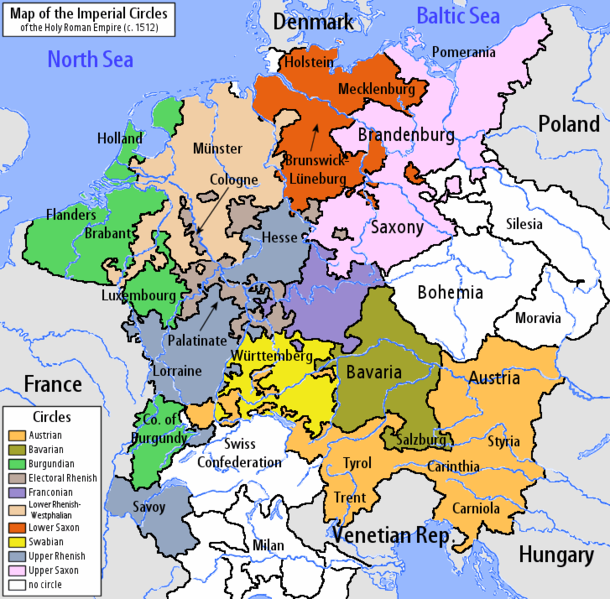 To the best of my knowledge the majority of Landsknechts recruited for the Swabian, Peasants & Italian wars were mustered in the Imperial circles of Austria, Wurttemberg and the upper and lower Rhine. The political map below illustrates these areas in a geographical context. 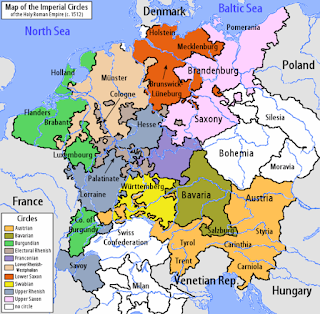 Clockwise from the upper left; Cross of St. George, Baden, Dinkelsbuhl,Memmingen,Wurttemberg, Ulm, Augsburg, Fugger. Once I am happy with a design it is printed on to an adhesive backed A4 sheet of paper and fully painted in the same way as I paint figures. I then cut out the flag using a scalpel and leave a trailing edge to make it easy to peel. The backing sheet is then peeled off and the trailing edge cut away. The flag is then carefully wrapped around the banner pole and neatly stuck to together, being careful to avoid any overlapping (a small amount occasionally does happen but you can paint over this). You can put folds in by gently creasing the flag where you desire. You can then add further tone and highlight colours in line with any folds you have created. Congratulations once more. What most amazed me was how such a fine and helpful post has no comments... Ah, İ know people were speechless. Thanks for all this info. Lovely. Excellent in fact. I like to paint my flags as well. Lovely.Most effective identity protection service. Custom signage in Sydney. are best choice for printed banners.